While not a canonized saint in the Roman Catholic Church (see Berger’s posts on the reasons for this), Hildegard is recognized in Lutheran and Anglican / Episcopal liturgical calendars, as well as in the regional German Roman Catholic calendar. Then I saw a bright light, and in this light the figure of a man the color of a sapphire, which was all blazing with a gentle glowing fire. And that bright light bathed the whole of the glowing fire, and the glowing fire bathed the bright light; and the bright light and the glowing fire poured over the whole human figure, so that the three were one light in one power of potential. And again I heard the living Light, saying to me: …. Therefore you see a bright light, which without any flaw of illusion, deficiency, or deception designates the Father; and in this light the figure of a man the color of a sapphire, which without any flaw of obstinacy, envy, or iniquity designates the Son, Who was begotten of the Father in Divinity before time began, and then within time was incarnate in the world in Humanity; which is all blazing with a gentle glowing fire, which fire without any flaw of aridity, mortality, or darkness designates the Holy spirit, by Whom the Only-Begotten of God was conceived in the flesh and born of the Virgin within time and poured the true light into the world. And that bright light bathes the the whole of the glowing fire, and the glowing fire bathes the bright light; and the bright light and the glowing fire pour over the whole human figure, so that the three are one light in one power of potential. Recent literature has presented the abbess herself as a painter, but there is no medieval evidence to support this hypothesis, and if it were true both Hildegard and her biographer would surely have mentioned such a notable achievement. Given the particularities of the work, however, it seems likely that the artist (or artists) lacked formal training and worked under the visionary’s personal supervision. The painter may have been a gifted Rupertsberg nun, or perhaps a monk from St. Disibod or another monastery closely associated with Hildegard. Whoever the artist, he or she stayed close to the text of the visions and apparently eschewed the use of models, recombining iconographic motifs in new forms as creatively as Hildegard re-envisioned the familiar themes of Christian doctrine. The paintings are thus far more than illustrations; insofar as possible, they draw the viewer into the numinous world of the visionary’s own experience. It is noteworthy that none of [Hildegard’s] analogues is gender-specific, and the naming of Father and Son is balanced by a reference to “the embrace of God’s maternal love,” which is charity. 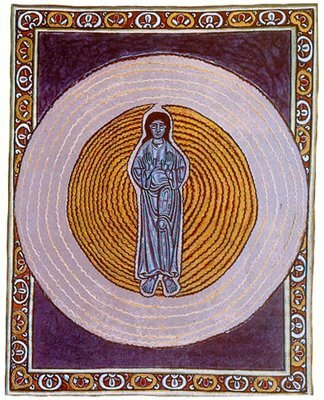 From the rather abstract language of Hildegard’s text the artist has conceived another mandala-image. “Light” and “fire” become concentric circles glimmering with gold and silver leaf, and quivering lines suggest the vitality and energy of the living God. Next Is Affirmative Action ‘Reverse Racism’? Thanks so much — and thank you for pointing that out. Several of us, myself included, actually own the People’s Companion, and used to be in the habit of praying together with it… but then the semester shifted and we all fell out of routine — so thank you for the reminder to pick that back up again, particularly for days such as this! Nice post, but I have a small quibble: Hildegard is not the first female composer of hymns. The earliest (that I know of) is Kassiani (or Cassiani), a 9th century Byzantine abbess, poet and hymnographer. She was also an outspoken defender of icons, for which she is canonized in the Eastern Church. Her most famous hymn is still sung on Tuesday night of Holy Week. Here is a wikipedia link: http://en.wikipedia.org/wiki/Kassia. Thanks so much for this correction and the link, Maria — this is wonderful information. I’m quite grateful to be be introduced to Kassiani and have my Occicentrism corrected! I’m late to this and really all I can say is how much I thoroughly enjoyed this post. Thank you – Bridget and all of you. This site is an oasis.